Can walking 10,000 steps a day be the key to losing pounds or maintaining a healthy weight? Possibly! Read on to find out why. Whether you are just starting to build your fitness habit or are a more advanced exerciser, a regular walking program offers so many incredible health and fitness benefits! Increasing your daily step count can help you stay more active when you are not already working out, or to get you moving more often to spark up a new exercise habit. Even if you have been exercising routinely for years, it may not be enough to combat the ill effects of hours of sitting, so adding more steps to your day can be not only beneficial for your waistline, but for your overall health too. By now, you’ve probably heard this general, “take 10,000 steps a day” recommendation, and while it might be a good goal for aim for, it may not be the best place to start. Recent research says the average adult walks about 5,900 steps a day, with many of us coming in way under that. Instead of suddenly just doubling your daily steps, simply try adding in about 500 extra steps a day, increasing slowly each week to gradually build into more activity and work your way up to 10,000. By Time: 15 minutes at a brisk pace is roughly 1 mile (this is of course a general estimate, since everyone’s stride lengths differ exact mileage may vary). By Steps: 10,000 steps is the approximate equivalent of 5 miles, so count 2,000 steps as 1 mile. With a Tracking Device: A pedometer or activity tracker can help you tally up your daily count, so if you decide to use one try designating a few times each day to check it so make sure you are on task for your goal. This can help prevent obsessing too much over the number or forgetting to check it until the end of the day when you may feel pressured to catch up to your goal all at once. One thing to keep in mind with trackers however, is that most are designed to measure straight forward strides only (and one study found that many can be off by as much as 30 percent! ), which means if you use one for an indoor walking workout, for instance, your step count may not be completely accurate as you may be moving more in place, side to side, etc. 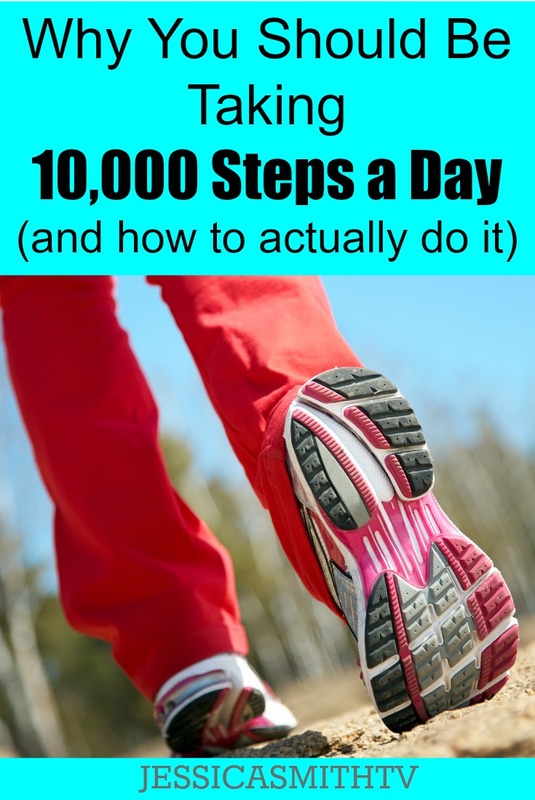 10,000 steps can seem daunting if you are starting out with a much lower daily count, and it’s not always easy to fit in extra steps, especially if the weather won’t cooperate or you only have free walking time very early or late in the day! So if you need extra help reaching your goals, be sure to check out our “Walk On: 5 Fat Burning Miles” DVD that includes 5 varied mile walks plus two bonus routines – the “Strong Feet and Ankles Workout” and the “Strong Knees and Hips Routine” to help you walk strong and pain free for years to come! What about other forms of exercise? Is 10,000 steps a day all you need to stay fit? Does this mean that simply walking 10,000 steps a day means you can stop working out? It depends on where you are in your fitness journey. If you haven’t been exercising regularly, increasing your daily steps can be a great way to build your fitness level and ease into an exercise habit. But once you feel ready to keep challenging your body, be sure to start including other cross training activities like resistance training (to help combat the loss of muscle mass that occurs with aging), stretching (to improve your range of motion and help prevent injury) and other forms of cardiovascular activity (interval training, for example, can help your produce more of the anti-aging human growth hormone) to keep your body in top shape. Want a walking plan that can help you reach all of those goals? Be sure to check out our “Walk On: 21 Day Weight Loss Plan” a complete low impact program that includes strength training, standing abs conditioning, interval training and even flexibility and relaxation techniques – all in the form of fun, walking based workouts! Long time fan and have most of your DVDs my favorite of all time is the 5 mile 10k, especially the turbo and boogie down walks. I use that DVD daily to help me reach 10k steps and would love to know when a similar DVD will be coming out (need to switch up with other faster pace walks). I’ve tried all the other Walk On choices but the 5 mile 10k step is by far the best please tell me when you’ll be doing another 10k step video with faster pace miles. Thank you! You have been my go to girl for years, but for the past 2 years I have put on 25 pounds due to osteoarthritis in the knees, menopause and hallux limitus. I am so frustrated and want to do something! I used to love to do your walking workouts, but I can only walk for a limited amount of time before the toe pain kicks in. Can you suggest exercises that don’t require me to bend my knees and toes too much. I am so excited because the Walk On – 5 Fat Burning Miles DVD just arrived. I am anxious to start. I have been following your YouTube channel since April 2016 and am so happy to have found you. Your positive attitude and wonderful exercise routines are definitely motivating. I recently started a blog and have mentioned your exercise videos and website in a nutrition and exercise article. Thank you and say hi to Peanut! I like your approach to exercise; you’re positive and realistic. I am over 60 (shh don’t tell anyone) and am fairly fit but I need some adaptations. I like step because I can work against gravity without as much stress on my joints. Maybe you could find or you have someone who could create some videos for older adults, our population is growing. I want to raise my heart rate but I need more time to warm up and some moves I can’t do as quickly anymore. Thanks for giving your all to this. Hi Jessica. I love your DVDs and was hoping you would one with kettle bells. Will 10,000 Steps Weight Loss-Walk On DVD be available again? I gave 2 for gifts for Christmas. I’m so tempted to ask for one back. I want it and can’t find it in stock anywhere. If it is not available on Amazon where can we find it? Hi! Thank you so much for sharing the gift of our DVDs – how thoughtful 🙂 And not to worry, our 5 Miles DVD is only temporarily sold out due to high demand, but we hope to have it back in stock on Amazon.com in about a week. Will 10,000 steps weight loss-walk on be available again?I want it and can’t find it in stock anywhere. Jessica… Are the walking DVDs actually in the home? Hi Beverly! All of our walking DVDs are designed for use in your home (I know it sounds a bit strange!). And we do more than just ‘walk’ to avoid joint strain and boredom 🙂 You can check out our options and read through descriptions and reviews here for more info. Hope that helps! I just wanted to tell you that I love your workouts. I have many of your DVD’s. I was wondering if you could tell me how many steps you take in one of your 30 minute Walk On Workouts? Hi, Jessica, will there be more DVDs of your 5-Mile Walk, or are they sold out for good? Thanks! I was wondering if or when you would have a digital version of your new 5 Mile DVD?